Heart Rate Variability (HRV) is an extremely powerful tool for coaches, athletes and those seeking optimal health & performance. All clients of mine - whether performance focused, fat loss, or general health - track their HRV daily. The data is that useful. 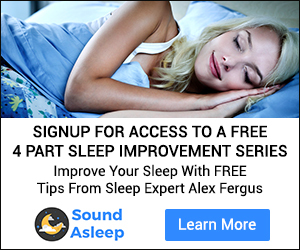 Unfortunately, many people have never heard of HRV and many that do know about it brush it off as a gimmick and never invest any time learning about its powerful features. I personally have been using HRV in my own training and recovery from stage 3 adrenal fatigue for the past 2 years. 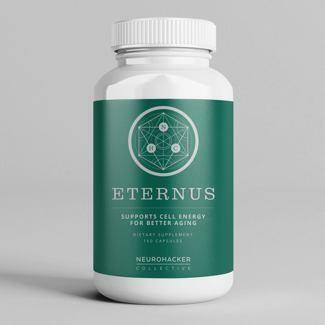 I have read the science, worked closely with software developers and have seen the benefits first hand. Therefore I now use it with my clients in my coaching programs. Lets review HRV and in particular Elite HRV below. "Basic Heart Rate Variability (HRV) is the measured changes of the time intervals between successive heart beats. Unlike Heart Rate (HR) that averages the number of heart beats per minute, HRV looks much closer at the small fluctuations of the heart that occur in response to internal and external events." "Knowledge is power. By applying the appropriate calculations to Heart Rate Variabililty (Elite HRV does that for you), you can better understand your nervous systems, cardiovascular systems, and respiratory systems in response to life’s stressors. By acting on your HRV biofeedback insights, you can optimize your training, manage stress, improve health, and maximize your performance in life." HRV is the variation in time between successive heart beats over a given period of time. The time between beats is often referred to as 'R-R' intervals and are measured in milliseconds. HRV is a lot more than your average heart rate (or Beats per minute) reading. HRV looks at the fluctuations, or variability between heart rate beats. If your heart rate has identical interval lengths between heart beats (ie, exactly 1 second between beats with an average of 60bpm), you have a low HRV. This is actually 'bad'. If your heart beats follow a more variable pattern, with heart rate intervals of varying length (ie, you still have a 60BPM heart rate, but the time between beats varies from 973ms to 1102ms) you have a high HRV - which is 'good'. I know this may sound counterintuitive, and many would think its the other way around. But just how a drummers beat is always slightly off (albeit, our hearing could not pick it up), this variability gives the music 'soul' that a robotic electronic drumbeat may not possess. If this still doesn't convince you, then Mark Sisson at Marks Daily Apple has done a great job of explaining HRV and reviewing the huge amount of science behind the whys and the how in this article - Have You Checked Your Heart Rate Variability Lately. Due to years of research into HRV, we can now use this data to figure out our current state of parasympathetic (rest & digest) or sympathetic (flight or fight) dominance. 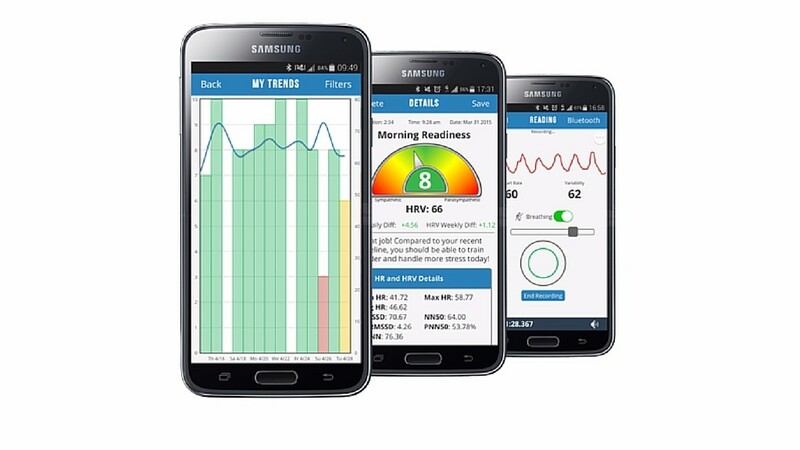 In fact, HRV has been used for decades to track the health & recovery of patients. Low HRV scores are linked to coronary heart disease (1), and diabetes, high blood pressure & high cholesterol (2), and a low HRV score is common in those who have had heart attacks (3). High HRV scores are associated with longevity in the elderly (4). Though measuring your HRV to track your health status is helpful, as a performance coach I find the beauty of HRV in measuring day to day recovery and readiness levels. Have You Checked Your Heart Rate Variability Lately. HRV: The Single, Next Big Trend In Biohacking And Self-Quantification And How To Use It. Elite HRV: The Benefit To The Client & The Coach. Measuring your HRV is very easy, all you require is a Bluetooth enable Heart Rate Strap (I use the Polar H7), a smart phone with Elite HRV installed, and 3 minutes of your morning (its best to track your HRV first thing upon waking). - If the client has recovered sufficiently to train at maximum intensity today, or if we need to drop back the workload to a lighter day, or perhaps a complete rest day. 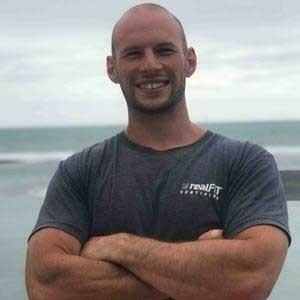 - How the client is performing on his current training program and whether the load is too much, not enough and can pushed harder or just right. - Data that I can review when building the client's training program and work load. 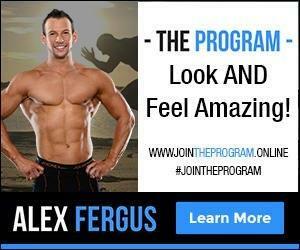 I build personalised training programs for my Coaching Clients every 4-6 weeks. When building these programs I can review the clients average HRV over the past weeks and months. If we have come off a really intense training program with a lot of volume (or the client had a period of poor recovery due to extra stress outside of training), I will see his average HRV falling, in which case I can soften the next training plan to ensure we do not run the risk of overtraining. - Green - Meaning you're good to train hard today, your sympathetic and parasympathetic systems are in balance and you have recovered well. - Orange - You may be dominant in one of your autonomic systems, recovery hasn't been ideal. Today should be a lighter workload day. The occasional orange reading shows that the client is pushing hard, if there are multi orange scores then the client is starting to push too hard without adequate recovery, running the risk of overtraining. - Red - You are in a deep state of stress or recovery. Avoid training today and rest instead. If you must train, keep it to low intensity mobility work. Yoga, breathing exercises and walks are also great here. 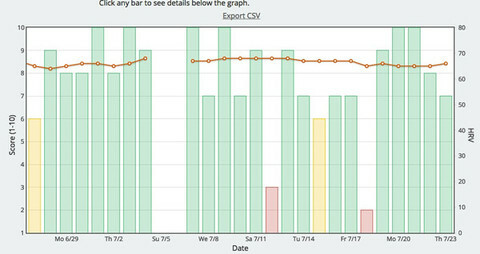 His average HRV (orange line) is trending flat, which means his training load and recovery is rather balanced. Ideally we would see this line pickup, and with coming improvements in diet, training, supplementation and lifestyle I expect to see this trend slow turn upwards. You can also see his daily readiness levels (the green, red and orange bars). Overall he has a lot of green bars which is great. The odd orange bar is also fine, as a well designed training program should push hard to encourage adaptation and a stress response. The key is working in adequate rest and recovery days to allow the body to recover from these stress loads. You can see from the above recording that his HR was really low (53 - for context purposes, the top 10% of HRV scores in Elite HRV are 74.5 and above, with the average being a score of 60). His rolling average HRV score is in the high 60's, so a 53 is very low. Also, a key stat is the low weekly difference (-17.55), this is a key stat (along with the daily difference) that is used in calculating your daily readiness score. Finally, we can see the readiness score is red (meaning do not train), and the needle has swung over the sympathetic side - this shows high levels of stress (fight and flight). 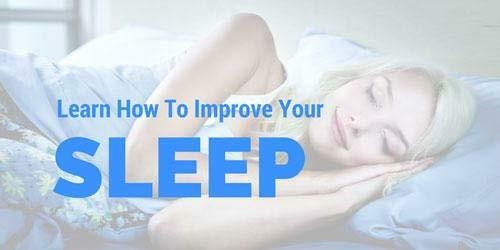 If we had trained given this reading, we would be risking further stress on the body - pushing this too hard increases the chance of adrenal issues, overtraining, mental burnout and suppressed immune function. For those reasons, on this day we worked in an easy walk and an afternoon nap. As I mentioned above, the great thing about my coaching clients tracking their HRV load is seeing trends and patterns. Does a client always get a red recording after a particular training day? If so, I will incorporate a rest day after this session going forward. Is a client consistently getting green, high readiness scores on the planned rest day? Maybe we need to push harder and work in an extra training day. Did the average HRV score drop off after the previous training plan? Maybe that program rather intense, and the next program should be slightly less intense. Is the client always seeing high green scores? Maybe the program isn't hard enough or the client isn't pushing hard enough in the gym. As you can see, the information and feedback is extremely powerful not only to the client, but to me as his coach. 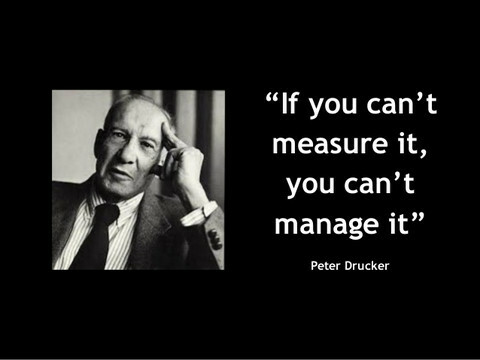 Remember, you cannot manage what you cannot measure. 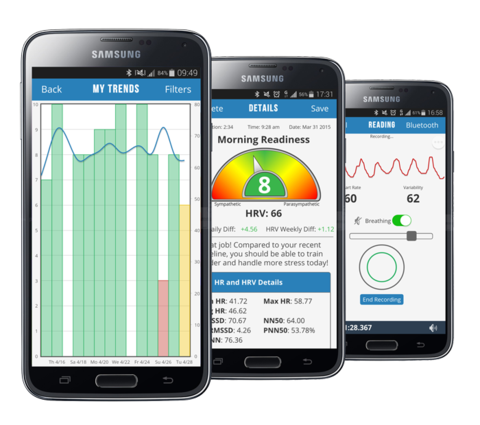 If you use HRV what are your experiences with the technology? If not, do you think you would use it? Or maybe you still have some questions about HRV? Share your thoughts below.